We will introduce the book, but most of all on the occasion, we’d like to celebrate with you! 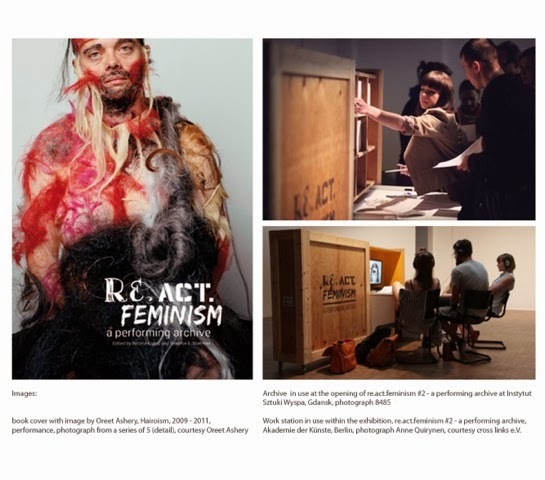 Also there is the unique opportunity to auction one of the re.act.feminism archive modules or other paraphernalia during this evening. This book of 320 pages includes eight essays by curators and scholars Kathrin Becker, Mathias Danbolt, Eleonora Fabião, Bettina Knaup, Laima Kreivytė / Oxana Sarkisyan / Mare Tralla / Reet Varblane, Laurence Rassel / Linda Valdés, Angelika Richter and Rebecca Schneider, seven visual essays, more than 200 illustrations, the biographies of all the 180+ participating artists and an appendix with German translations. Published by Verlag für moderne Kunst Nürnberg and Live Art Development Agency London. Special offer only on 26 March 2014! The book will be on offer for a discounted price. Special editions will be available with signatures by some of the artists and writers.